Would you like your copy of Teresa Dare's books autographed, but can't make it to one of her book signings? She would be glad to personalize, autograph, and send you an archival quality adhesive bookplate. Please allow a few weeks for return. Don't forget to include a note, telling her to whom you'd like it signed! 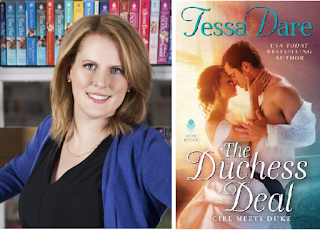 Tessa Dare is the New York Times and USA Today bestselling author of fourteen historical romance novels and five novellas. PLUS... check out her Free Reads! OR... Click for your signed e-book, by Tessa Dare, with a personalized inscription.